Isn't it the case that she has double nationality because it is impossible to renounce Argentinean nationality? Het is op dit moment dan ook niet mogelijk voor de koningin om afstand te doen van haar Argentijnse nationaliteit, zo erkent Buma. Some parties (mostly on the left) say: "Double citizenships must be allowed". Other parties (mostly on the right) say: "A choice for the Dutch citizenship must mean an end to another citizenship". Note that the mentioned Rijkswet has an automatic working the other way: "When a Dutch citizen accepts the citizenship of another state, the citizenship of the Kingdom of the Netherlands is automatically lost".) So in essence politicians have the opinion that the policy on citizenship between two states must be equal. A Dutchman accepting Turkish citizenship looses his Dutch passport. An Turk accepting Dutch citizenship keeps his Turkish passport. There is an anomaly in that. how silly. if argentina does not allow for its citizens to renounce citizenship, what is maxima to do? it is not her fault. it is not as if she can change the rules of argentina or that they can make an exception for her. and... does it really matter in the first place? she is a dutch citizen and has stated repeatedly that she is dutch, although she obviously loves her birth country. It has little to do with Queen Máxima herself. Her position was put forward by opponents: "So you want to rob our popular Queen from her Argentinean passport?" in an attempt to halt the idea. The Central Statistic Office stated that in 2015 there were 1,3 million Dutch citizens with a second passport from another country (so eligible to vote, to do compulsory military service in another counrty, etc.). This massive number of (mostly Turkish and Morrocoan) double nationalities indeed bring discontent to the surface. When Erdogan locks up thousands and thousands of journalists, military, judges, teachers, etc. without any form of process, you don't hear them. But when Erdogan appeals to them to go on the street, there they are... en masse cheering for him: "Our Great President!". The Dutch saw Turkish people waving Turrkish flags and chanting for a foreign President while they were born in the Netherlands, while their parents were born in the Netherlands, while their grandparents were born in the Netherlands. It is not so futile as only the Queen's second passport. I dont think this is an attack on the Queen but if a law passes it has to pass for all equally. I didn't know she had a double citizenship, I thought she had given it up when she married given who she was marrying. I guess I was wrong. Mentioned above that Argentinians can't denounce their citizenship, maybe that's an issue she faced in the past if she did plan to do so. I guess it's not easy for all and other ways should be studied. Shouldn't we close this thread? It's already 21 pages! Greece became one of the most exciting destinations to spend Easter. There are celebrations and rites of the Orthodox Church throughout the country, especially in small villages or islands, where traditions are stronger. That is why the kings of the Netherlands decided to celebrate Holy Saturday on the island of Spetses, only ten minutes by boat from their Greek refuge, located in the area of ​​Doroufi, in Ermioni, to the south of the continent. 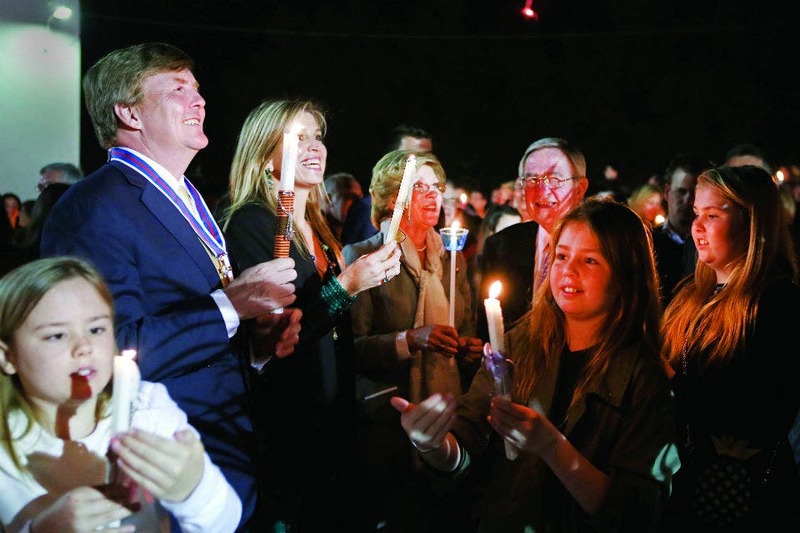 Invited by the kings of Greece, Constantine II and Ana Maria, Máxima and Guillermo, together with their three daughters, Amalia (13), Alexia (11) and Ariane (10) participated in the ceremony in which the Hellenes gather Hour before midnight in his church to light white candles with holy fire (which is distributed in temples throughout the country). And then, every believer must take the walk to his home with the candle lit, mark a cross on the door of his dwelling and extinguish the flame once inside." The Family is on a short holiday in Austria. I think i spotted Maximas Brother stepping out of the car. Why are they in Austria and any idea when they went? The news said they arrived Sunday Evening in Salzburg and they visited Seewalchen in Upper Austria. They will return home Tuesday or Wednesday. Prinses Beatrix is with them. William looks really annoyed with the press! but who can blame him? I am surprise Maxima's father could made the trip considering how fragile he is! I think theres a massive difference in the way Maxima and WA appear to handle the media, Maxima just seems to get on with it whilst WA goes out his way to get in their way. BTW I thought they had sold that government jet? Tja... he does not control the foreign press as he does the Dutch one. So it can hardly be a surprise that there are photographers abroad. I am sure that none of these images of clips will be shown in Dutch magazines, papers or television. The new thread can be found here.